CHICAGO (WLS) -- Taste of Chicago 2014 features an all-star line-up both in the kitchen and on the stage. 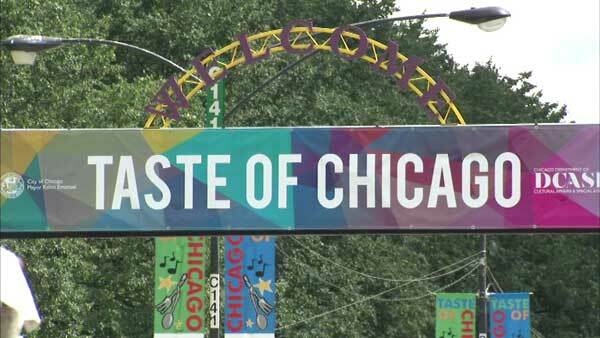 The Taste of Chicago 2014 runs July 9-13 in Grant Park. Entrance is free. Food and drink tickets are sold in strips of 12 for $8.50. Ticket sales end at 8:30 p.m. each night. The festival is open 11 a.m. to 9 p.m. on Wednesday, Thursday and Friday, and from 10 a.m. to 9 p.m. on Saturday and Sunday. Officials encourage people to take public transportation; several street closures are in effect during the festival. Click here for a list of what is and isn't allowed and here for a map. However, some restaurants are only popping in- and up- at the Taste for a couple of days at a time. New additions there include Sol de Mexico, Kamehachi and Mama Mia. Full List of Pop-Up Restaurants. Interested in a unique dining experience? Some of Chicago's best chefs invite you to dine with them. But hurry to reserve a spot. Tickets are selling out! Chefs: Matthias Merges, A10, Yusho and Billy Sunday; Erling Wu-Bower and Amanda Rockman of Nico Osteria; Paul Virant, Vie and Perennial Virant; and Andrew Zimmerman, Sepia; and Art Smith, TABLE fifty-two and LYFE Kitchen. Taste of Chicago is a little bit country, a little bit rock-and-roll. Throw in the blues, some singer songwriters and there's a whole lot of Chicago. Concerts are held throughout the festival at two stages - Petrillo Music Shell and Bud Light Stage. While the concerts are all free, those wanting to secure a good spot at the Petrillo Music Shell have the option to buy seats. Headliners include Emmylou Harris and Parker Millsap on Friday, and Jeff Tweedy and Lucinda Williams on Saturday. Kids are welcome at the Taste of Chicago. Check out the Kidz Zone , open until 7 p.m. each day.